The Short- Getting off to a fast start and never relenting Avengers: Age of Ultron is Marvel's most ambitious film to date. The script is packed with the action and humor fans have come to love even if the story itself lacks the punch delivered in Captain America 2 or The Avengers. Unlike the first Avengers film, Age of Ultron is more of an appetizer for the Main course that begins in Captain America Civil War and culminates in Avengers Infinity War Part 1 and 2. Marvel has become of the most enviable operations in film, they make massive movies in scale and budget and they are wildly successful. They also have pushed the envelope, each one a little riskier, and each one a little bigger, and everyone has been waiting for the Superhero bubble to burst. For almost its entire run time Age of Ultron is one really fun ride, a ride that pays off a number of times with intense action sequences, witty banter and plenty of winks and nods at the films to come. In order to deliver Age of Ultron had to get one of the stranger Marvel villains just right. 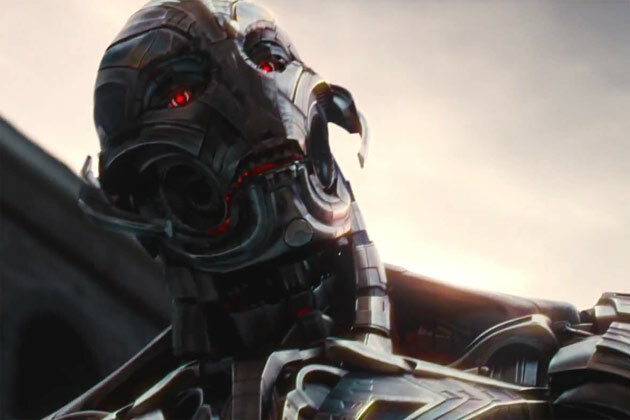 At face value Ultron is no different than most of the recent super hero baddies. Ultron believes that in order to achieve peace he needs to destroy humans and more importantly the avengers and his creator Tony Stark. Ultron is better than how he is normally played out in the comics because of the beautiful performance from James Spader. Spader gives the type of villainous badass performance you would expect from an actor playing one of TV's best villains on The Black List. Spader gives the type of motion captured performance that normally comes from scene stealer and newly added Marvel villain Andy Serkis who has just one scene but will appear as the villain Ulysses Klaue in The Black Panther. Serkis has one very excellent sequence that leads into the film’s most promising action sequence with a crazed Hulk taking on Iron Man in his "Veronica" Hulk Buster suit, named after the on again off again girlfriend in the Archie Comics. Serkis and Spader aren't the only new recruits in the Marvel universe to give excellent performances but Elizabeth Olsen (Godzilla, Martha Marcy May Marlene) is fantastic as Wanda Maxioff aka The Scarlett Witch. Needing little setup for the Maxioff Twins whom without giving anything away are being used as Hydra weapons in the film’s opening sequence. Pietro Maxioff, Wanda's brother is played by Olsen's Godzilla love interest Aaron Taylor Johnson; it was Olsen’s involvement that led Johnson to accepting the role. Johnson has less screen time but they both bring some youth to the fray and both actors give enthusiastic performances. As for the rest of the cast, Chris Evans and Robert Downey Jr lead in screen time and rightfully so as Evan's Captain America and Downey Jr's Iron Man have become the two main attractions with Evan's starting to really get a handle on his leadership role and both actors leaning into the love/hate relationship the two have growing into what will become a face off in Captain America: Civil War. Chris Hemsworth returns as Thor and while I'll get to his screen time in the next paragraph as usual Hemsworth brings a dry wit to the socially inept God of Thunder, including a particularly memorable scene with Tony Stark and Thor comparing and debating which love interests is better, with Thors casual " She may win the Nobel Prize" followed by a shrugging smile. Scarlett Johansson coming off the Black Widow dominant Captain America: The Winter Soldier has some good moments in Age of Ultron but it's her partner in crime Jeremy Renner's Clint Barton, who seems to have a much larger role then in his previous performance in The Avengers. Barton is given a dangerous amount of screen time including one of the films more spoiler-y moments half way through. In TV, Barton's extra screen time would signal certain death but without giving anything away Whedon's usage of Renner and Hawkeye is definitely different. Age of Ultron also gives those side characters some much needed love including a nice role for Don Cheadle, a welcomed amount of Maria Hill played by Cobie Smulders, and more Falcon (Anthony Mackie) who added a boost to Captain America: The Winter Soldier. The best kept secret is what happens with Paul Bettany's Jarvis but I won't spoil that reveal for those of you whom have not seen the film yet. Age of Ultron does a lot of set up, in fact nearly every moment Thor is on screen he is setting up Thanos and the introduction of the rest of the final 2 gem stones that make up the Infinity gauntlet (more on that later). I don't have to love the fact that Age of Ultron was being used as set up for Marvels Phase 3 but I do appreciate all the work Joss Whedon put into the film with small pieces of dialogue that fill in whats been going on since The Winter Soldier and each characters previous film. Including a line of dialogue that reveals Falcon is still on the trail for Bucky Barnes aka The Winter Soldier following the end of the film reveal that Barnes is finally remembering his past. When we first learned about how Marvels phases were supposed to work certain promises were made not by Feige or Whedon themselves but just how the breakdown and order of the films was supposed to work. The Avengers films are supposed to be the culmination for 5 or so movies of set up, so the fact that Age of Ultron carries it's own story along with set up for the 3 war movies to come (Captain America Civil War and Avengers Infinity War Parts 1 and 2) could be frustrating for some viewers looking for less sizzle and more steak. Especially Considering this is the second straight Avengers movie that includes more then a few hints at Thanos (Josh Brolin) especially if you stay after the credits. Let’s note also that Whedon chose to give us just one post credits sequence and it was short and comes only 2 minutes in instead of the normal 5-8 minutes of waiting impatiently. Age of Ultron may not be an Oscar worthy Superhero movie, even though it's purpose is not to win awards but to be enjoyable if not mind numbing fare. Age of Ultron doesn't have quite as much payoff as The Avengers did but Joss Whedon's script is fun, and they find enough room for most of the major members of the cast. It is smothered with long action sequences and an incredible amount of winks and nods towards past, present and future Marvel works. You can take away points for one or two plot holes but Age of Ultron was an enjoyable summer movie and an excellent entry into the expansive Marvel Universe. Now on to Phase 3! Starring-Robert Downey Jr, Chris Evans, Mark Ruffalo, Chris Hemsworth Scarlett Johansson, Jeremy Renner, Cobie Smulders, Elizabeth Olsen, Aaron Taylor Johnson, James Spader, Paul Bettany, and Anthony Mackie.